Russian troops load a missile onto an Iskander-M launcher during a 2016 exercise. 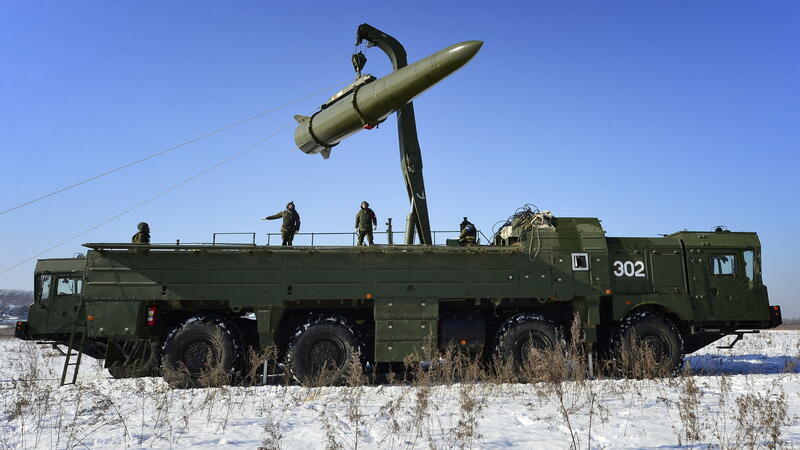 Russia is now deploying missiles to Kaliningrad, its Baltic exclave. "It really looks like the base is getting a pretty comprehensive overhaul," says Jeffrey Lewis, a scholar at the Middlebury Institute of International Studies at Monterey who has been analyzing the satellite imagery taken by San Francisco-based company Planet. "Right now, it's just a big construction site." Meanwhile, over 5,000 miles away in the Texas Panhandle, production has begun on a new kind of American nuclear weapon. 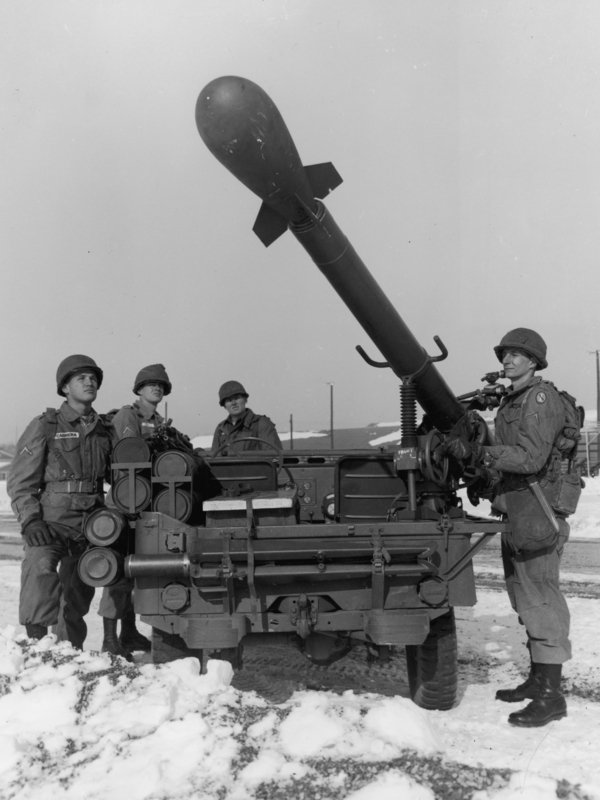 Known as the W76-2, it is a much smaller variant of an existing nuclear weapon. The Trump administration says this new warhead will help counter Russia's capabilities. Lewis and other experts say these new weapons have the potential to be used in the sort of nuclear war America hasn't prepared for in years. Rather than a global conflagration, this would be a tactical nuclear conflict, where weapons would be deployed on the battlefield. "I think there may be a renewed enthusiasm in both the United States and Russia for new nuclear weapons in combat roles," Lewis says. The idea of using small nuclear weapons in a conflict took hold at the height of the Cold War. In July 1962, hundreds of troops rehearsed an attack in the Nevada desert. But before they went in, an armored personnel carrier fired a miniature nuclear weapon known as a Davy Crockett at a simulated enemy position. The weapon detonated with a tiny fraction of the strength of a city-busting thermonuclear warhead. Within the hour, U.S. troops and tanks crossed the blazing desert to declare a simulated victory. A U.S. Army soldier operates a Davy Crockett battlefield nuclear weapon mounted on a jeep. The U.S. military once planned for wars in which small battlefield nukes would be used. Back then, that was how some imagined nuclear war would look: little nukes used together with conventional weapons to overwhelm or hold back an adversary. As the Cold War stretched on, the U.S. built thousands of nuclear mines, missiles and artillery designed to be used on the battlefield. But they eventually fell out of fashion. "Over the course of the 1980s, those weapons increasingly became seen as a liability," Lewis says. Then, in 1991, the Soviet Union collapsed. "At the end of the Cold War, the United States said, 'That was kind of stupid. Why do we have all this stuff? Let's get rid of it,' " says Matthew Kroenig, a nuclear policy expert at the Atlantic Council and an associate professor at Georgetown University. The U.S. dismantled nearly all its battlefield nuclear weapons. But Russia took a different path. It has kept thousands of battlefield nukes. "So today, Russia has nuclear land mines, nuclear torpedoes, nuclear depth charges, nuclear artillery, nuclear short-range missiles," Kroenig says. Russia's battlefield nuclear weapons are widely believed to be held primarily in central storage, far from any potential conflict. But the missiles that could carry them are not. At bases like the one in Kaliningrad, Russia is deploying missiles and making upgrades. The weapons, along with some thinly veiled statements by senior Russian officials, are in part designed to send a message, says Olga Oliker, director for Europe and Central Asia at the International Crisis Group. That message: "Don't forget we have nuclear weapons. Don't forget we could use them." 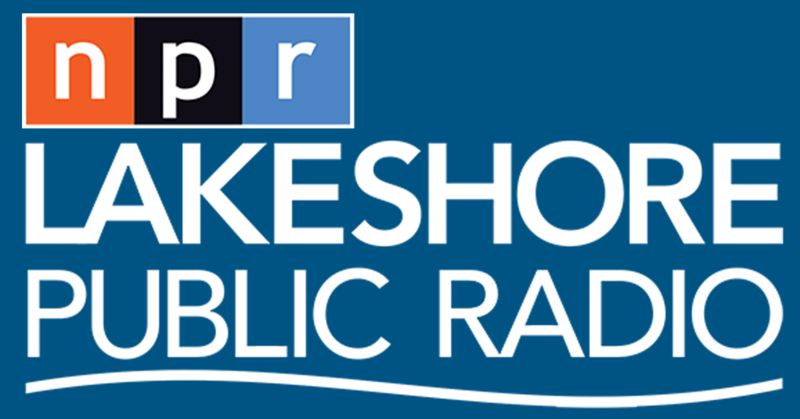 Oliker believes Russia's talk around nuclear weapons is mostly posturing. But the Trump administration says there are signs that Russia may be tempted to actually use its tactical nukes. The administration's Nuclear Posture Review, released last year, warned that Russia might decide to fire off a battlefield nuke early in a crisis. If that happened, Kroenig says, the U.S. and its allies wouldn't be able to respond in kind because the only nukes it has left are big weapons designed to fight an apocalyptic kind of nuclear war. "We could back down to avoid nuclear war, or we could retaliate with our large strategic nuclear weapons, potentially risking a larger nuclear attack," Kroenig says. That is the value of the new W76-2 being built by the administration, he argues: "If you use a low-yield nuclear weapon, we can respond with one, two or three of our own." 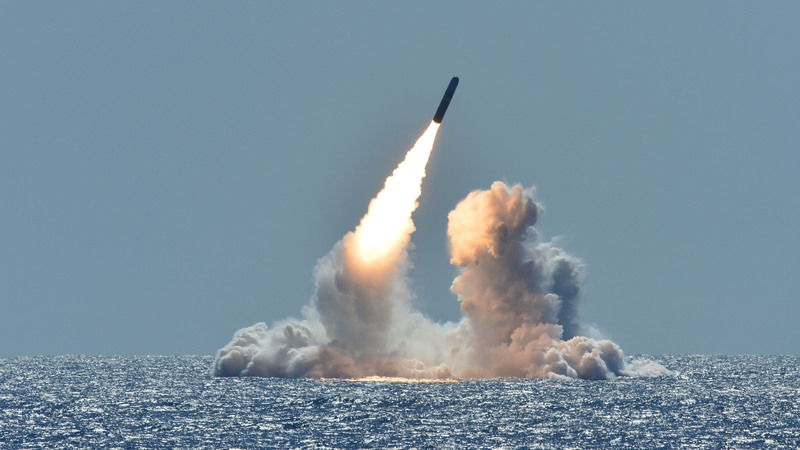 The U.S.'s new W76-2 nuclear warhead is a smaller version of the much more powerful W76-1. They are launched on the same kind of missile. In addition, the Nuclear Posture Review calls for a new nuclear sea-launched cruise missile. Kroenig says that is likely to take around a decade to develop. But there are others who worry that these new weapons could start the U.S. and Russia on a path back to the dark days of the Cold War. Hans Kristensen, director of the Nuclear Information Project at the Federation of American Scientists, warns that these less powerful weapons may make nuclear weapons seem more usable to U.S. war planners. "I think it's a waste of money, and it's a dangerous kind of mission creep," he says. Kristensen says that the W76-2 in particular is a "very unorthodox" kind of low-yield weapon. Although the government has provided no official details about the warhead, Kristensen and others believe it is built by retooling a much more powerful thermonuclear weapon, known as the W76-1. The W76-1 has a nuclear "primary" component that detonates the much larger thermonuclear "secondary" part of the weapon. By removing or disabling the big secondary while leaving the small primary intact, Kristensen says, workers can relatively quickly convert a large strategic weapon into a less powerful battlefield device. But Lewis notes that this creates another problem: Both versions of the W76 are launched on the same ballistic missile. "All the Russians are going to see is that a missile that only carries nuclear warheads is heading towards Russia," Lewis says. "Russian policy, as [President] Vladimir Putin has said many times, is not to wait for it to land." Instead, Lewis believes, the Russians would most likely retaliate with powerful long-range weapons. Kroenig disputes that. If the U.S. were to launch a weapon, he says, it would very likely be a single missile in response to a Russian battlefield nuclear weapon. The Russians are likely to recognize that, he believes. In the end, he says, the goal of these new U.S. weapons is not to fight some new war that uses nukes and troops together on the battlefield. Rather, they are meant simply to signal to Russia that America has options. "The problem right now is that Russia thinks that they can get away with it," Kroenig says. "They think that they can use a limited nuclear strike and there won't be a response." The true battle over these new weapons may end up in Congress. While Republicans seem ready to back the Trump administration's request for more battlefield nukes, the newly elected Democratic majority in the House of Representatives seems intent on blocking them. "We do not view nuclear weapons as a tool in warfare," Adam Smith, now the Democratic chair of the House Armed Services Committee, said in a speech in November. "It makes no sense for us to build low-yield nuclear weapons."